The following report was obtained from the website of the Pacific Northwest Border Health Alliance. 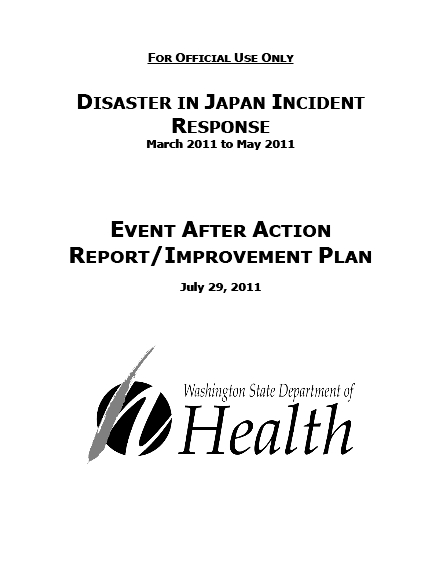 This After Action Report/Improvement Plan covers the public health response in Washington to the disaster in Japan that began with the earthquake off of Japan’s northeastern coast on March 11, 2011. The 9.0 earthquake caused widespread devastation throughout Japan, and the resulting tsunami crippled the nation even further. The Fukushima Nuclear Power Plant, located in Fukushima Prefecture of Japan, was severely damaged by the earthquake and tsunami, creating a radiological disaster. The tsunami from the earthquake also made landfall across the Pacific Ocean including coastal areas of Washington state. The radiological release at the Fukushima Nuclear Power Plant was due to the loss of cooling capability in the reactor cores, causing a partial melt down of nuclear fuel, a buildup of hydrogen gas in containment that had to be vented, and resulting explosions that caused radioactivity from damaged fuel to enter the atmosphere and be carried by the jet stream to the Pacific Northwest. For the state of Washington, responding to potential public health and medical impacts of both the tsunami and radiation issues from the earthquake in Japan culminated in many lessons learned— strengths as well as areas in need of improvement. Those lessons learned are captured in this after action report. The Washington State Department of Health worked hard to make sure that all emergency management, public health, and medical partners were involved in the response. From local public health agencies to governmental partners and tribal partners, the agency worked hard to provide information on radiation and the health messages to share with the public. The response strengthened our relationships with our partners and provided our Office of Radiation Protection staff an opportunity to educate a broader audience in radiological preparedness. • Manage the event using the incident command system. • Provide the residents of Washington and response partners with timely and accurate information about the response to the disaster in Japan and potential impact in our state. • Provide leadership to the state on the possible radiological impacts of the incident. • Provide education and open communication to partners, media, and the public. • Use of the incident command system (ICS) to manage the response effectively. • Development and distribution of consistent public messaging to our partners and the public. • Use of the agency website with specific information about the incident that consolidated data and education materials onto one site, so it was easy to find and easy to understand. • Radiological technical staff providing expertise and education to guide the incident response. • Collaboration between Department of Health divisions. • Lack of planning for this type of incident. There was no plan in place for an incident that happened around 5,000 miles away in Japan having a possible impact in Washington. • Lack of information being shared by federal partners hindered the state’s ability to respond timely and effectively. • The incident command team had difficulty at times identifying and sharing information with all the appropriate staff in a timely and effective manner. • Staff responding to the incident were overburdened without monitoring them for stress and exhaustion. • Timely sharing of information among public health professionals with our partners. • Identifying roles and responsibilities regarding authority to determine what should be tested and prioritizing those tests. • Lack of radiological benchmark standards to be used for test result comparisons. Too many of the standards that are currently used are for long-term exposure and are not applicable to this type of event. Overall the response to the disaster in Japan by state health and its partners went very well. The lessons learned from both the response to the tsunami and radiological contamination are great lessons to build on. Some of the lessons learned helped to build even greater confidence in the agency’s ability to respond effectively, and others will help the agency be better prepared for a future incident. The after action items in this report will be used to improve plans and procedures, better train staff, and build a more resilient agency. The response to the disaster in Japan has already strengthened the agency’s ability to respond to public health emergencies, and the continued implementation of the lessons learned will only strengthen that ability.